In a Time Magazine article published December 13, 2011, Congresswoman Giffords addresses the struggles she and her husband have endured as they continue to adjust to the “new normal” brought about as a result of a bullet that pierced her brain on January 8, 2011 when she was reaching out to her Congressional district in Arizona. So many of us have new normals as we walk, or fall, head first into Baby Boomerism. This normal may involve a loved one who has a fatal or debilitating illness. This new normal may be characterized as our own bodily/physical struggles inherent with our age. Each of us have some sort of chronic something-or-other that inhibits our ability to function at 100%. What is the chronic something-or-other that inhibits your ability to function at 100%? The above question is a rhetorical one. Neither myself nor the public need to know the specifics – but you know the specifics and you’re the one making long-term adjustments as a result. What processes do you follow to unearth the optimism that exists somewhere in your psyche? How do you overcome your personal challenges so that you end most days victorious, rather than defeated? 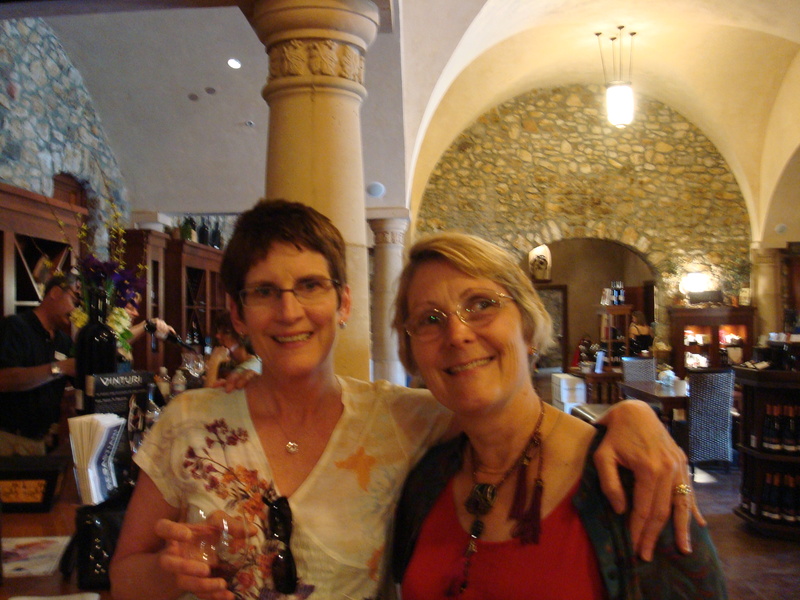 My wonderful sister, on my left, and I at a Napa winery - tasting wine of course! Cheers! For me, it’s acceptance. For me, acceptance doesn’t mean giving in or giving up; rather, acceptance means being o.k. with how things currently are and finding ways to succeed within that new normal. This mentality or attitude is more optimistic than you may think. Again, for me, I decided to allow optimism to nurture the hope that oftentimes is buried deep within me. Things could very well change for the better – which doesn’t have to be defined as being 100% problem-free. Nope. If I garner optimism at the start of each day, I’m making a conscious and aware decision to acknowledge and celebrate even the smallest of victories that might occur in the next 24-hours. If I wait for a humongous, star-spangled mega-victory, I may wait forever. Instead, I attempt to be aware of even the smallest improvements/goodnesses in my day so that my life is filled with many victories to celebrate. The previous sentence says that “I attempt” to garner optimism throughout my day. I don’t always succeed – but I try. What small victory can you celebrate today? What works for you? The rest of us would love to celebrate that victory with you. This entry was posted in Alzheimer's/Dementia, Blog Category Headlines, Caregiving, Family issues, Health & Wellness, Personal Struggles and tagged Alzheimer's, fatal illnesses, physical & mental challenges, struggles of aging.